- Liquid Aleppo soap: 500 ml with a pump top for easy use. - Ingrediants: Aqua, potassium olivate *, glycerin *, potassium laurate, Olea europaea oil *, Laurus nobilis leaf extract *, potassium benzoate, potassium sorbate, sodium lauryl glucoside, polyglyceryl-2 dipolyhydroxystearate, glycerin, Laurus nobilis oil, eugenol, linalool.. 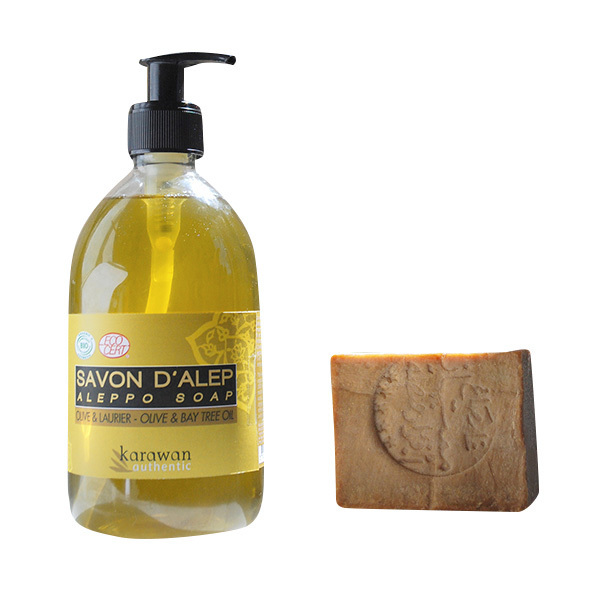 The original product was the Aleppo soap, it is exclusively manufactured in Aleppo with olive oil and bay leaf (laurel), all ingrediants are also carefully selected to give you the best quality product.